Since I go abroad in exactly 3 weeks I thought it would be appropriate to finally start my summer series!! Today's post is all about beach essentials! Most people would have a long list of things that are vital to take to beach however I decided to keep mine to a minimum! The first thing that is important is swimwear, that you feel comfortable and confident wearing! I love this aqua blue bikini from Brakini! It is a lovely set which looks great on holiday! I paired this with a beach cover up! This beach cover up is from Forever Unique! I think this goes great with the aqua theme. The cover up is very light weight and is a sheer chiffon material. I personally try avoid wearing darker colours because it attracts the heat so wearing this white cover up will ensure that you are much cooler in hotter climates and temperatures. 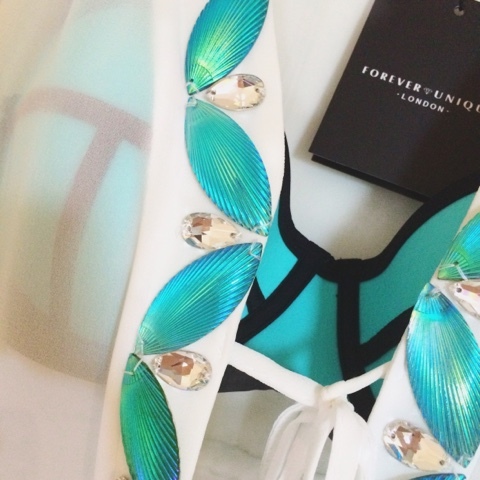 I love the detailing of this cover up too with the little diamante beading around the neckline and the duo chrome blue and green effect shells. I love the two tonall effect of theses shells and compliments the bikini. I also like how the cover up has two sections which tie together. It has very large bat wing style sleeves and the length covers everything that you would want covered. The only downsides to this cover up is that firstly you cannot wear it like a kimono style as it is sewn together. Something to consider as well is the size that you buy. I would normally be a size 10 in beach cover ups because I prefer them to be slightly over sized. I was sent a size 2 and it is really big on me. I believe an American size 2 is the equivalent to a British size 6, so just consider which size you buy if you choose to purchase a beach cover up from Forever Unique. Forever unique is more on the designer end, but the quality of the garments are amazing. My cover up is £135, linked below. I wanted to tie in with the aqua blue theme so I picked out these Jack Wills ditsy floral print flipflops. These are easy to go with any outfit and are super comfy. I always find that cheaper flipflops can rub between your toes so these JW flipflops are perfect as they are much better quality. I am still on the hunt to find some new sunglasses, however sunglasses are a definite must have for a beach day. The next outfit I think that is appropriate for someone who wants to be slightly more covered up for the beach is a midi length style dress that is floaty. I love this dress that is pictured above from Blue Vanilla. It's a lovely aqua blue shade with oriental floral details distributed throughout the entire dress. I love the very thin pleats through the lower half the dress. I love how flattering this dress is and it is great for multiple occasions. It's great for on the beach but I also think it would be great for going out for food on holiday! This dress retails for £32 which I think is a bargain! You can purchase this dress from Blue Vanillas online website which I will link below! The final outfit is a casual yet put together look. High waisted denim shorts are always great to get on holiday because they go with practically everything! I always love the way denim looks with white so I've paired the shorts with this sheer crochet Cami top from ChiChi clothing! 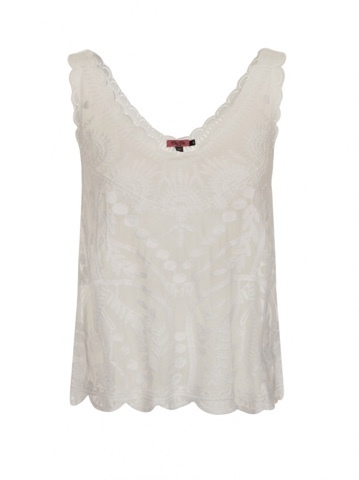 This top looks great with skirts, jeans and shorts however I think it is perfect for on the beach!! This top retails for only £14.99 from ChiChi clothing, I will link their website down below! Finally, it is important to keep your skin hydrated and protected. I personally like using a lighter SPF moisturiser on my face, I love the Garnier Moisture Match illuminating moisturiser which has an SPF 20 inbuilt. Is inbuilt the right word haha? Anyways, I prefer using a higher SPF on my body, for example factor 30 for the first week then drop down to factor 20 or 15 for the next 5-7 days and for the remainder I tend to go without or use some sort of tanning oil to optimise my tan. I also think it is important to hydrate generally, it is so vital you drink a lot of water so having water at the beach is important to ensure you do not become dehydrated. I think I will have 1/2 holiday related posts a week until I head off next month. I am away for almost 3 weeks so my blog posts will be limited however I think I will try post once a week with holiday pictures and hauls. I love the color pairing, reminds me of photos of the beaches in Fiji! Have fun on holiday when you leave in three weeks! Ooooh! I love neoprene swimwears!